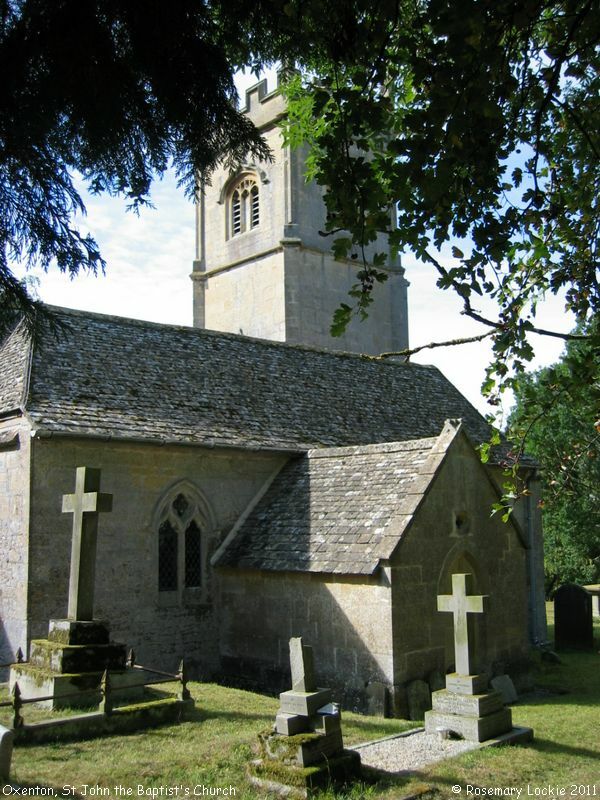 This Place of Worship was founded in the 13th century, and we understand it is still open. 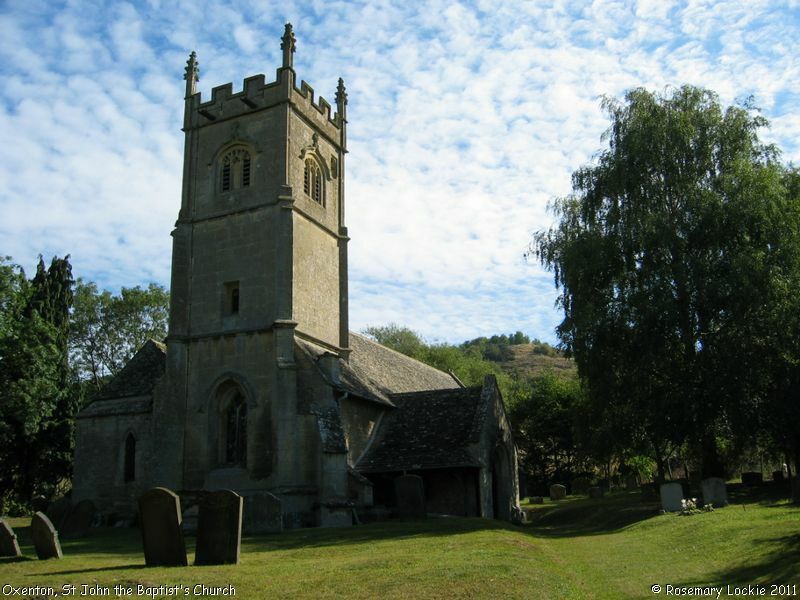 Oxenton is a gem of a church - described in the guide leaflet as "an almost unspoilt medieval church of the 13th century tastefully restored in 1905". The church can be found almost at the end of a no-through road, and has a neat little car park. Entering through the gateway, on the left was a sign saying "Watch Out for Rabbit Holes", featuring two rabbits dancing up and down gleefully, with toothy grins on their faces! The sign can be seen on the last photograph of this set. 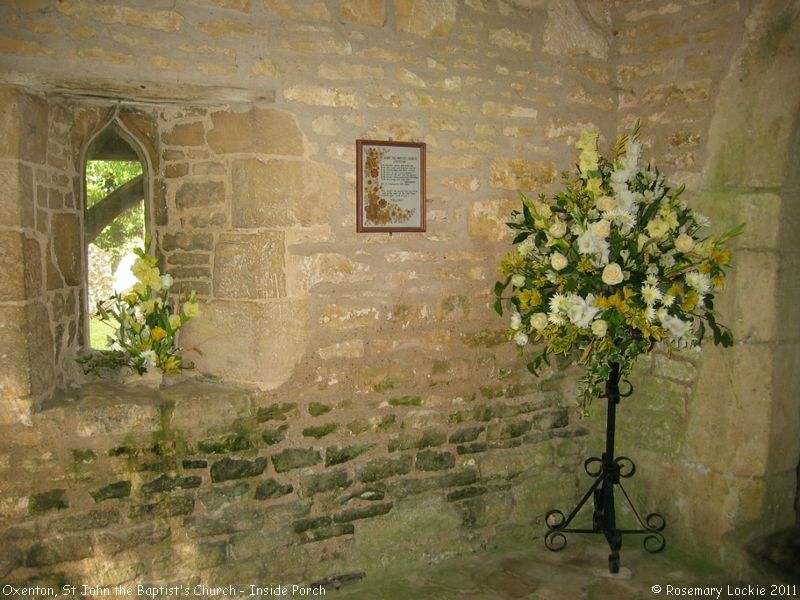 Inside the porch were fresh flowers, and an unusual sampler, with a tasteful dedication to St John the Baptist. 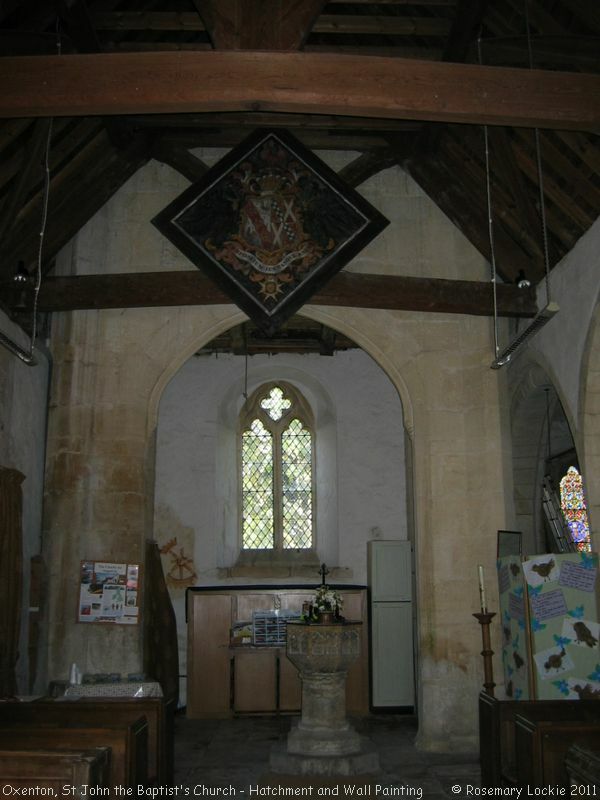 Inside the church are almost all the usual fittings, including an aumbry on the north wall of the Chancel, with exquisitely carved wooden grille, and two piscinas - one in the chancel, dating from the 13th century, and a trefoil-headed one in the nave, next to the pulpit. 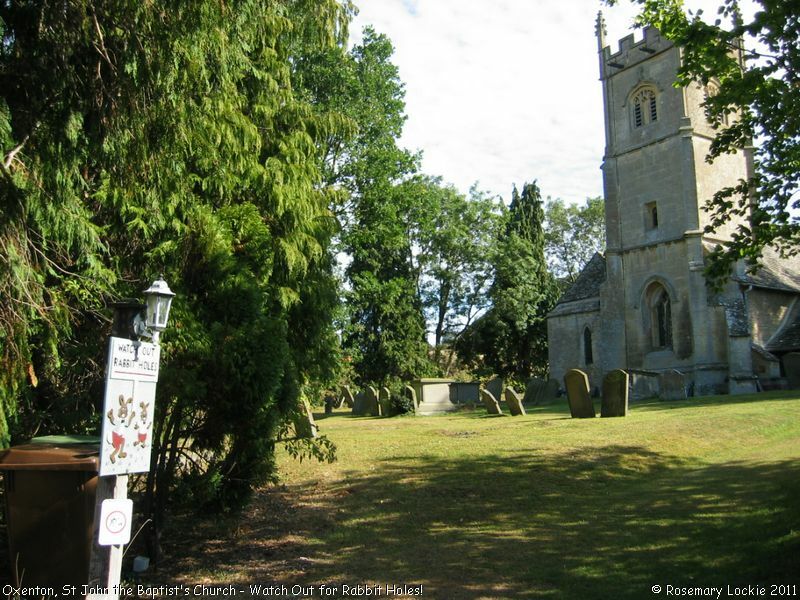 The latter, according to the guide leaflet indicates there may have been an altar nearby, which to me suggests the church may be older than the 13th century. 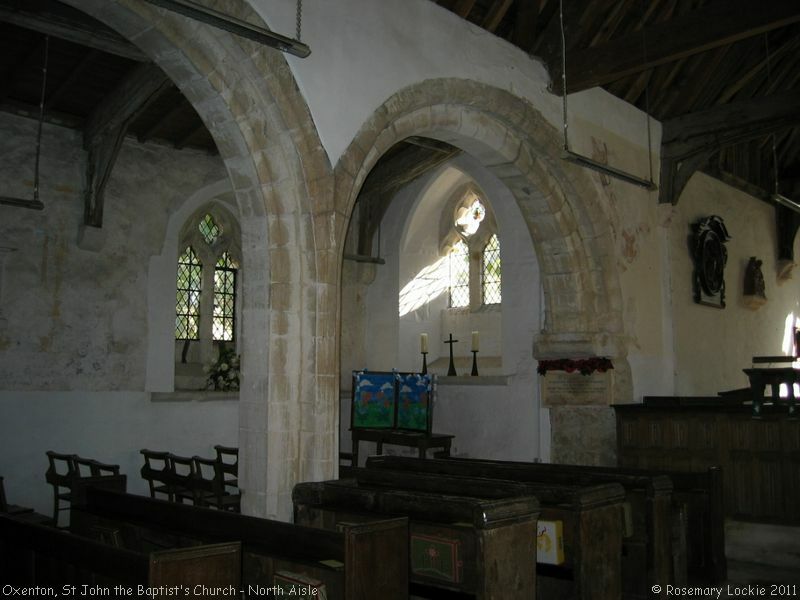 There is evidence of this too, in the rounded Romanesque-style arch at the chancel end of the arcade, if it is original. The Hatchment on the archway supporting the tower is of the Earl of Ellenborough, a resident of Southam, but also Governor General of India, and a large landowner in the village. His also is the wall monument to the right of the North doorway. Lozenge-shaped floor tiles in the Chancel are Elizabethan. 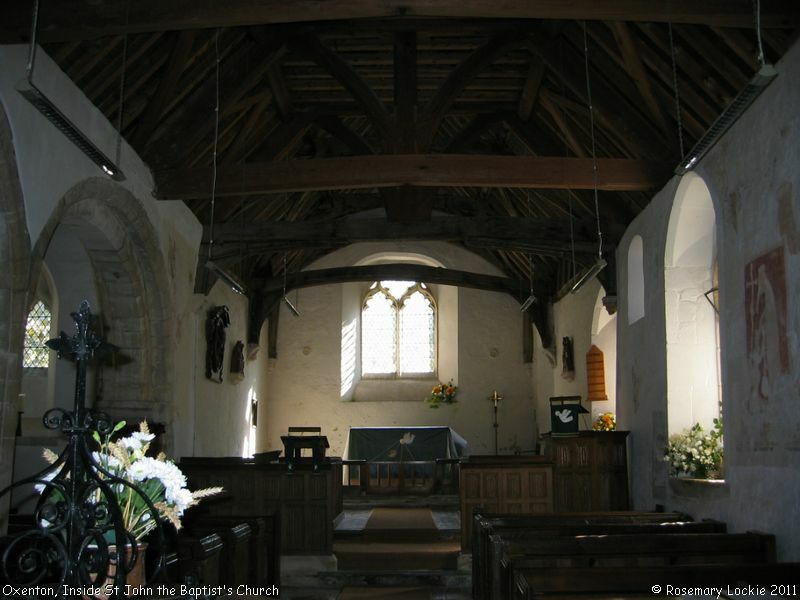 Pulpit and choir-stalls are of "linen-fold Elizabethan oak panelling"; whilst two carvings of wood hang on the Chancel walls. These are replicas made in 1980 of originals, dating from the 15th century, which were stolen. Henry William HOPKINS, Pte. 13th. Glos. Regt. Who fell in the Great War 1914-1919. The real treasure inside the church - in my opinion - is however its Wall Paintings. 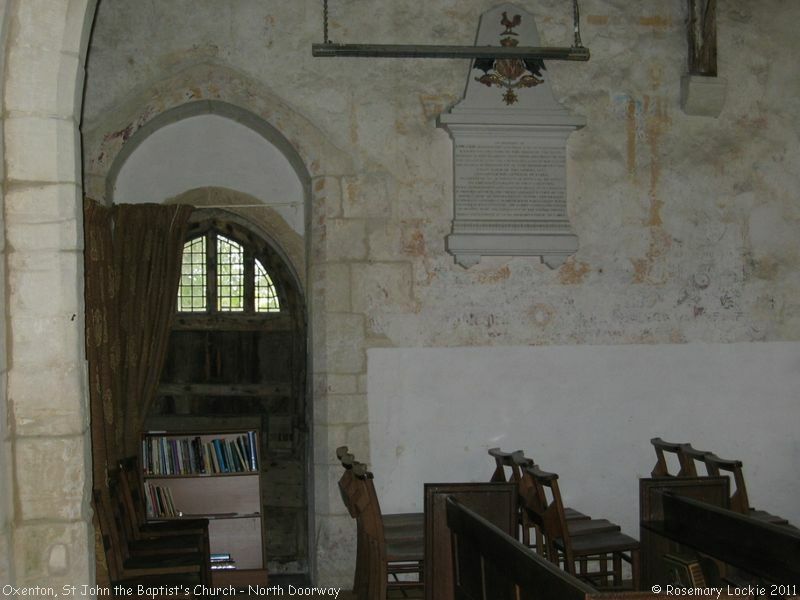 There are two "Catherine Wheels", one on the north wall, and one on the west wall - the latter can be seen on the 4th photograph, to the left of the west window, inside the tower arch. 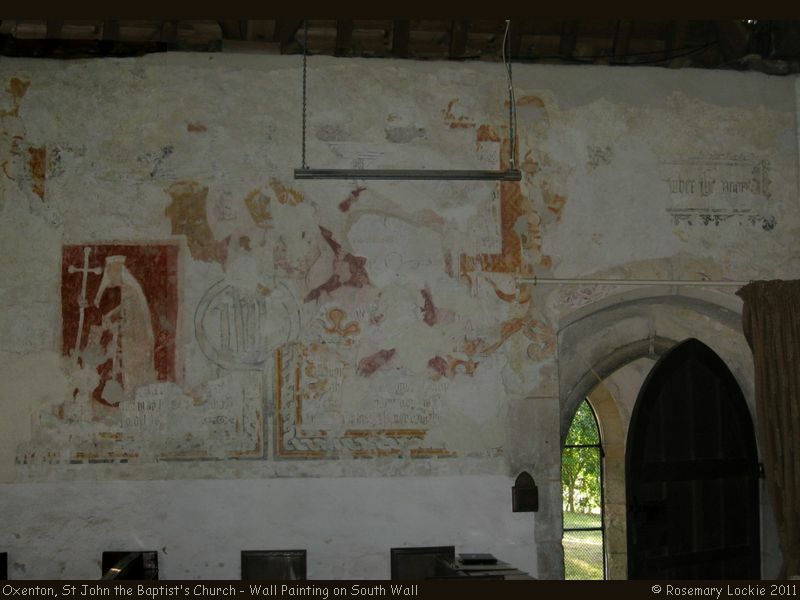 Another fragment of painting can be seen on the 3rd photograph, high on the wall at the north east end of the nave. This looks to me as if it might have been a shield, or coat of arms. St John the Baptist's Church, Oxenton shown on a Google Map. Places of Worship in Oxenton shown on a Google Map. Information last updated on 20 Aug 2011 at 13:51. This Report was created 21 Mar 2019 - 04:05:43 GMT from information held in the Gloucestershire section of the Places of Worship Database. This was last updated on 7 Feb 2019 at 07:45.